With technology shaping the future it is important you consider technology and interaction when planning all aspects of your exhibition. You need to consider the before, during and after event interaction. Making the most of technology during your exhibition will determine its success. 80% of online users remember a video they watched in the past 30 days. Why not have a video on your stand as a way of competing against hundreds of other businesses? You can interactively communicate with your exhibition visitors via many channels – video, social media, internet, competition and lead capture. Any of the above channels are easily accessible when using technology such as TV screens, laptops, tablets or mobile phones. So, what are the benefits of being interactive? Exhibition halls are filled with back to back stands which are all competing for the same thing – visitors and interaction. Walking down row after row of shell scheme spaces, visitors need something that is going to entice them and grab their attention. You are more likely to draw in visitors by displaying engaging and interesting videos or product demonstrations. You meet 100s of faces when walking around an exhibition hall so remembering certain aspects can be difficult unless the interaction was memorable. Touch screen technology is a great way to interact with customers. You can display your website for customer browsing. This is ideal for showing off other aspects of your business which aren’t displayed on your exhibition stand. You can also provide an online survey or quiz using an iPad or tablet, or play YouTube product demonstration videos to customers to show the products in full swing. The more audiovisual content the better. Lead generation is the reason why businesses exhibit in the first place. Gaining new leads is important but not nearly as important as acquiring accurate lead details. There are many ways you can capture leads during an exhibition. You can use a data capture device which is like a barcode scanner. The data scanner automatically uploads the visitor contact information to a spreadsheet. You are normally emailed this at the end of the show by the company you rent the data scanner from. There is always a cost for this service, but it’s very accurate and allows you the chance for face to face interaction. Alternatively, you can also manually upload visitors details directly on to your business CRM system. However, this creates room for human error as during conversations you can mistype vital contact details which can lead to a loss of the contact. Having an interactive exhibition stand will help generate more traffic through to your stand. Creating a hands-on experience will often increase interest in your stand which will encourage more people to visit. Interaction gives customers a greater incentive to visit and an enjoyable user experience, as opposed to standing around hearing the same spiel they have heard all day long. Product demonstrations or interactive touch screen technology can be used to interact and engage your visitors. Not only does it increase the number of people genuinely interested in your business, but it increases the time they spend on your stand. People are more likely to leave quicker, or not stop at all if there is nothing happening on your stand to generate interest. It’s one thing to stand and talk to people but it’s another to offer them the next level of engagement. Towards the end of an exhibition, people can often become tired of talking, and engaging visitors can become harder and harder. Giving a visitor something to watch, listen to or even use will definitely increase the time they spend on your stand. In addition, it’s a great idea to offer a place to sit, a drink or even a small nibble. This gives you a great opportunity to engage with them while they are refuelling. Everyone loves a buzz. If your stand is the one that people are crowding round then more visitors are likely to follow. Depending on the product or services you are offering you can really wow the crowd with an interesting and interactive product demonstration. You can create a buzz with an on-stand competition. We don’t mean drop your business card into a bowl, we mean a competition which requires people to take part, ask questions and compete with one another. For some great exhibition competition, ideas see Great Competitions to Engage Your Exhibition Stand Visitors. What Can XL Displays Offer to Help? Apart from offering a wide range of high quality portable and modular exhibition display equipment, we offer accessories which are designed to boost interaction and engagement. 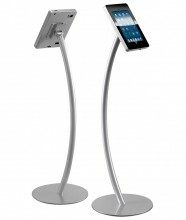 TV and monitor stands are ideal for businesses to use in a range of situations, such as at events, exhibitions, retail stores, training purposes and conferences. The stands provide a way to showcase media content such as promotional product videos that will draw in visitors and capture their attention. A showreel or presentation can be a powerful marketing tool, one which makes a massive impact and will help visitors to remember you long after the exhibition. For help selecting the right TV mount see our Portable TV and Monitor Stands article with features and benefits of each option. At XL Displays we are experts in exhibition stands and portable display equipment. For advice and more information on how we can help boost interaction at your next exhibition or event please Contact Us or call us on 01733 511030.